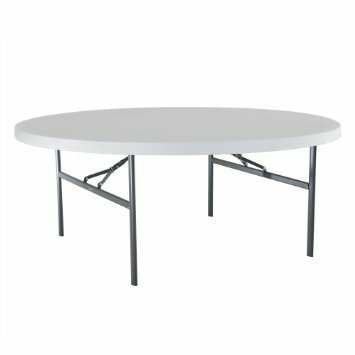 Lifetime 60" Round Commercial Folding table are constructed of high-density polyethylene, which is stronger, lighter and more durable than wood. The innovative nesting design lets multiple table stack together for space-saving storage. They will not crack, chip or peel, and are built for indoor and outdoor use. Question: What are the dimensions of this round table?